Good news! We allow you 1 free line of text (limit 10 characters) on any customized apparel item. If you wish to add more text there is an additional $.35 charge per letter. If you want text on the back of the shirt, or any other options please contact us at HelpDept@bowling.com for price quotes. The Ash City Fuse Polo is from their line of Extreme Eperformance shirts. The features of this sporty shirt make it perfect for any activity you choose. Hello Steven! At this time, bowling.com is only offering font placements on sleeves and the front of the shirt. 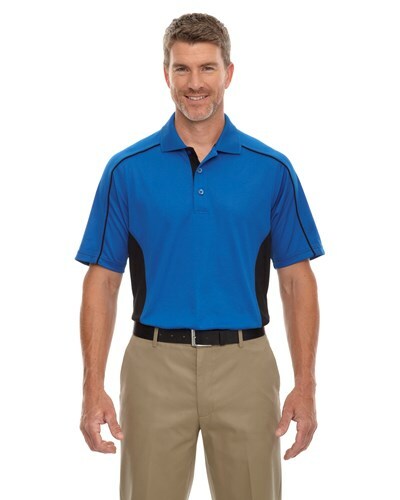 Due to the time it takes to produce the Ash City Mens Fuse Polo True Royal/Black ball it will ship in 1-2 weeks. We cannot ship this ball outside the United States.